20 October 2014, at 11:14p.m. US - The total number of pig farm samples that have tested positive for the Porcine Epidemic Diarrhoea (PED) virus now stands at 8,622 in 31 states, writes Jackie Linden. There were 61 new positive samples in the most recent week reported. 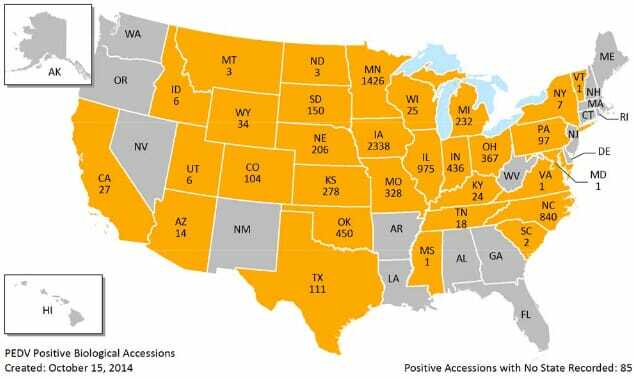 The National Animal Health Laboratory Network (NAHLN) reports 61 positive accessions out of 731 tested at 12 veterinary diagnostic labs for the week ending 11 October, according to the American Association of Swine Veterinarians (AASV). The total number of states reporting one or more PED-positive cases remains 31. 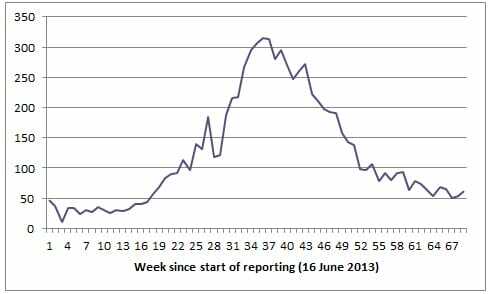 The total number of pig farm samples (termed 'laboratory biological accessions' in the official report) that have tested positive for the PED virus (PEDv) since April 2013 now stands at 8,622, which includes 61 for the most recent week. 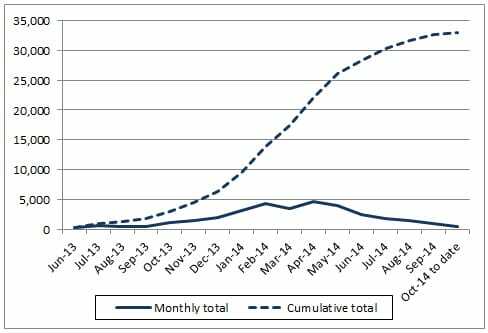 For the current month to date, 1,201 accessions were tested, of which 98 samples or 8.2 per cent tested positive for PEDv. Since testing was fully reported in November 2013, 35,126 farm samples have been tested, of which 22 per cent have tested positive for the virus. For the current month to date, 144 farms have been tested, of which 14 samples or 10 per cent were positive for PEDv. Since testing was fully reported in November 2013, 4,758 farm samples have been tested, of which 1,873 samples or 35 per cent tested positive for PEDv. For the current month to date, 203 farms have been tested, of which 14 samples or 6.9 per cent were positive for PEDv. Since testing was fully reported in November 2013, 5,222 farm samples have been tested, of which 1,519 samples or 26 per cent tested positive for PEDv. For the current month to date, 209 farms have been tested, of which 18 samples or 8.6 per cent were positive for PEDv. Since testing was fully reported in November 2013, 6.056 farm samples have been tested, of which 1,479 samples or 19 per cent tested positive for PEDv. For the current month to date, 93 farms have been tested, of which one sample or 1.1 per cent have tested positive for PEDv. Since testing was fully reported in November 2013, 2,958 farm samples have been tested, of which 673 samples or 17 per cent tested positive for PEDv. For the current month to date, 603 farms have been tested, of which 56 samples or 9.3 per cent tested positive for PEDv. Since testing was fully reported in November 2013, 17,438 farm samples have been tested, of which 3,296 samples or 18 per cent tested positive for PEDv. According to AASV, the total number of states with one or more positive results, according to the official report, still stands at 31. The total number of positive accessions on this report (up to the week of 21 September) is 8,560, 53 more than the previous week. Those states with 200 or more positive tests are: Iowa, 2,338; Minnesota, 1,426; Illinois, 975; North Carolina, 840; Oklahoma, 450; Indiana, 436; Ohio, 367; Missouri, 328; Kansas, 278, Michigan, 232 and Nebraska, 206. For the most recent week (week of 5 October), the state reporting the most new positive tests was Illinois with 12, followed by Iowa with 10 and Minnesota with nine. Also reporting one or more positive results were Arizona, California, Colorado, Indiana, Kentucky, Michigan, Missouri, North Carolina, North Dakota, Nebraska, Ohio, Oklahoma, South Dakota, Texas and Wyoming. 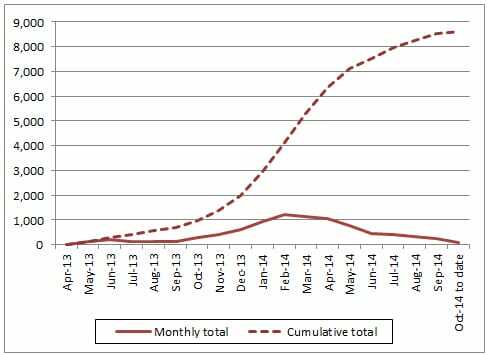 The total number of swine samples (termed 'biological samples' in the official report) since testing began in June 2013 now stands at 33,005. For the current month to date, 7,371 samples have been tested, of which 384 samples or 5.2 per cent tested positive for PEDv. Since testing was fully reported in November 2013, 203,221 samples have been tested, of which 15 per cent tested positive for PEDv. 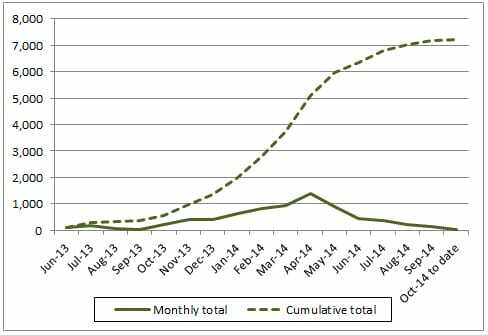 The total number of environmental samples testing positive since testing began in June 2013 now stands at 7,201. For the current month to date, 738 samples have been tested, of which 34 samples or 4.6 per cent tested positive for PEDv. Since testing was fully reported in November 2013, 35,432 samples have been tested, of which 19 per cent tested positive. Find out more information on porcine epidemic diarrhoea (PED) by clicking here.